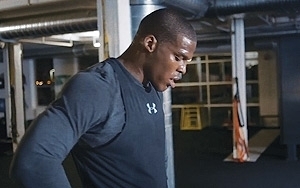 Under Armour and branded content agency GreenLight Media and Marketing have launched a documentary content series, “Huddle Up," detailing the trials and achievements (including off field) of Carolina Panthers’ starting quarterback Cam Newton as he prepares for the upcoming football season. The stories detail Newton’s journey from college football hero to a pro football team leader and his off-field work coaching and developing high school football athletes. The videos are an amalgam of footage of Newton on and off the gridiron, and of the athlete, in UA branded attire, speaking candidly about his life. The series, with a new episode each week, culminates Sept. 2 the week before the NFL starter. Says Brian Boring, VP of Creative at UA, "From 'Protect This House' to 'Ready For August,' our goal is simple… create stories that inspire athletes, specifically in these cases, football players. The content series format gives us an opportunity to tell a deeper story through the voice of an athlete." He tells Marketing Daily that when UA partnered with Cam Newton, "We told Cam we would help him tell his story -- as the athlete and as a man. This series is doing just that. His focus will be on winning football games. Our storytelling methods will adapt." Dominic Sandifer, president of L.A.-based GreenLight, tells Marketing Daily that the UA-branded content series has been a work in progress. "We’ve been discussing and working with Under Armour for some time on the best ways to develop a branded content strategy, and the kind of stories they could tell with their athletes." He says the two companies started hashing out a framework late last year centering on an athlete’s journey, especially those moments that test his or her will. "Under Armour challenged us to bring that to life for football season with Cam. The creative process was actually very collaborative on both the original idea, the story arc, and each episode." The videos live on Under Armour’s YouTube channel and at ua.com/huddleup, a site developed by GreenLight, "so they could live within the context of an Under Armour environment, without the videos themselves having to be overtly branded." He points out that the episodes stand alone without needing a branded title card. Promotional elements involve earned, owned and paid strategy combining Newton's and Under Armour's social graphs, as well as those of Newton's other partners, such as Gatorade and EA Sports. Sandifer adds that the effort includes 24-hour exclusives on select trailer and episodes with media outlets like The Bleacher Report; and paid/native support with partners like NFL.com, ESPN, Complex and CBS Sports thru the end of Sept. Also, promotional trailers for the series will be featured in ESPN TV spots, "but no 'traditional' ads are planned at this time," he says. "We are also exploring longer-form distribution in hour or half-hour increments with various TV networks for later this fall, as we shot over 250 hours of footage with Cam and there are several stories he has never told before that are very exclusive." Says Boring: "Over the years, I have been watching GreenLight innovate in the branded entertainment space. They are great storytellers who know how to create content that people care about. 'HuddleUp' is a collaborative project, and GreenLight was able to take our concept and turn it into a rich and engaging content series."